Money. Family. Work. School. Church. So much to do, so little time. And yet you long to develop a deeper commitment to family, community and most importantly, God. But how do you start? Where do you find the time? Is there an answer that you can live with? Is there any relevant wisdom from the 2000-year history of the Catholic Church to guide you in your quest for holiness at the "speed of life"? 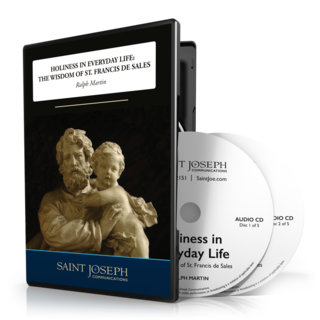 In the life-changing new five-CD series, Holiness in Everyday Life: The Wisdom of St. Francis de Sales, popular Catholic speaker Ralph Martin explains that you don't have to join a monastery to grow in holiness. Now, in this inspirational series, he'll introduce you to the essential teachings of St. Francis de Sales that will empower you to significantly transform your life. Never out-of-print, St. Francis de Sales' best-known work, Introduction to the Devout Life, is considered a mirror of its author-thorough, reliable, authoritative, kind and gentle. A great saint and doctor of the Church, Francis remains a perfect guide for today's busy Catholic as he focuses on how lay people, no matter what their circumstances, can and should grow in holiness. In this exciting series of five powerful talks, Ralph Martin will share with you the most important elements of St. Francis' collected wisdom to reveal how you can achieve true sanctity in your everyday life. Combining the teaching of the "Gentle Doctor" with those of Teresa of Avila, Vatican Council II, Pope John Paul II and more, Ralph Martin reveals that holiness in everyday life is not only possible, but actually makes you a better worker, spouse, friend, family member, or whatever your station in life. Most important of all, you'll discover the absolutely necessary process of transformation that must happen to make holiness in your everyday life possible. Order Holiness in Everyday Life: The Wisdom of St. Francis de Sales today and take your first step to a happier, holier more satisfying life. Ralph Martin is a devoted husband and father of six, the author of many books, the president of Renewal Ministries, the host of the weekly television program The Choices We Face, and an instructor of theology at Sacred Heart Seminary-among other things! Why St. Francis de Sales is called the "Gentle Doctor"
Are you aware of the virtues we must all acquire to be happy in this world and to save our souls? Where do you turn for good council? Where do you look for a good example of the spiritual life? Is it possible for an "ordinary" Catholic to become a saint just by using the many opportunities for holiness that lie hidden in each day? The saints, as models of Jesus Christ in their practice of heroic virtue, deserve both our respect and our admiration. In the new three CD (or cassette) series Wisdom of the Saints Fr. Shannon Collins, C.P.M. reveals that we should not only invoke the Saints in prayer and imitate their virtues, but also how we should also especially honor them by heeding their words. After all, if we will not listen to the saints, then whom will we listen to? In this essential series you'll discover how many of these holy men and women of God were granted the incredible gift of distilling a whole wealth of meaning into just a few words. Prepare to be encouraged and inspired as Fr. shares stories from the lives of two-dozen heroic men and women who have been raised to the altars of the Church. Now you'll learn the importance of true obedience from St. Francis and St. Dominic, the "little way" of spiritual childhood from St. Therese, how to resist the devil from St. John Vianney and much, much more. More than mere biographical facts and figures, Father shares the very heart of the saints, revealing many important lessons from their extraordinary examples to help you and your family to apply their virtues to your own lives. How you can find holiness and sanctity in the "here and now"
Why St. Francis was not a theological "hippie"
How the saints can be "in the world" but not "of the world"